How do Liverpool compare with the rest of the EPL in terms of the speed of their transfer operations in the summer transfer window? 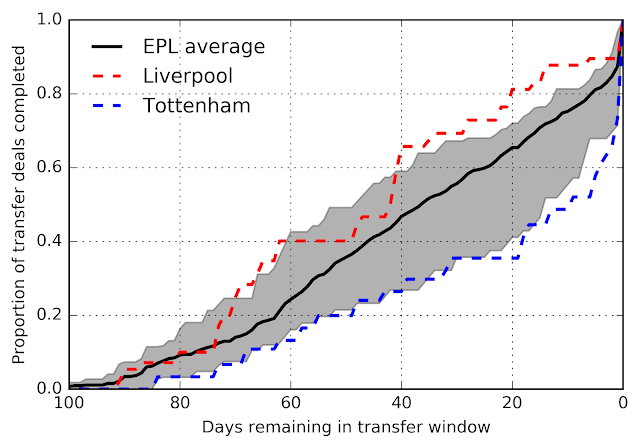 The plot below shows the proportion of transfers completed as a function of the number of days remaining in the transfer window. The black line shows the EPL average since the 2012/13 season; only transfers for which a fee was disclosed have been included, 464 in total. 50% of EPL transfers were completed with thirty-six days remaining in the transfer window, while 80% were completed with only five days left of the window. The grey region indicates the season-to-season variation over the last seven years. Despite closing early this year, there is little difference in the rate at which transfers were completed compared with previous seasons. Figure 1: The proportion of transfers completed as the summer transfer window counts down towards deadline day. 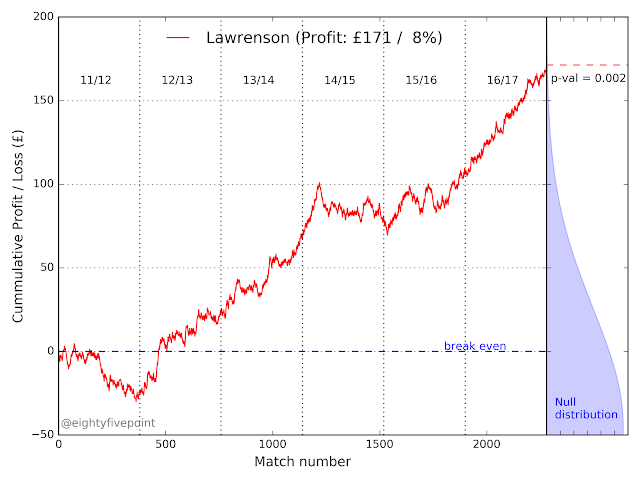 The black line shows the EPL average from the 2012 summer window to the end of the 2018 window; the grey region indicates the season-season variation. The red and blue dashed lines indicate the club-specific averages for Liverpool and Tottenham, the fastest and slowest clubs to complete their business. The dashed lines show the club-specific averages for Liverpool (red) and Tottenham (blue). 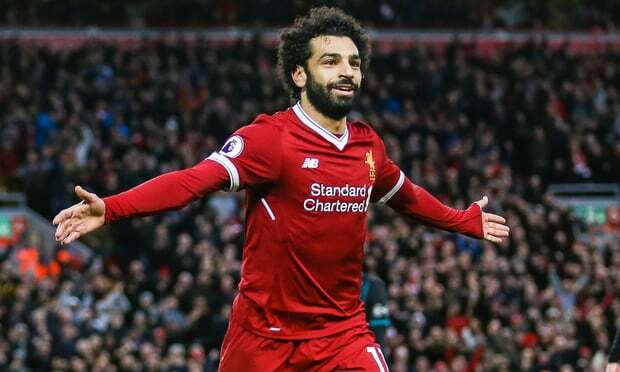 Over the last seven seasons, Liverpool have concluded their summer business more rapidly than any other of the nine EPL clubs to have maintained a continuous presence in the EPL. 80% of their transfers were completed with about 3 weeks remaining until the deadline, two weeks ahead of the EPL average. Generally speaking, they typically run their recruitment operation about two to three weeks in advance of the EPL average. Spurs are at the opposite end of the spectrum, completing a large proportion of their incoming transfer activity towards the end of the window. Nearly half of their summer transfers since 2012 -- 14 players -- were purchased with just a week remaining in the transfer window. Last year all their transfer activity occurred in the last two weeks of the window, with three players brought in within a couple of days of the deadline. A natural conclusion might be that Liverpool are simply more organised, drawing up a list of realistic transfer targets early and moving for them decisively. They have also shown patience in their transfer dealings, demonstrated by their willingness to wait until the next transfer window to complete business (see Keita and van Dijk) rather than hunt around for inferior alternatives should their first choice not be immediately available. Instead of purchasing another player late in the window, Liverpool have chosen not to purchase at all until their primary target is available. Spurs, however, are operating on a tighter budget in order to cope with the financial pressures brought by the construction of a new stadium. Daniel Levy may strategically be choosing to operate nearer the deadline to make opportunistic purchases and avoid price hikes driven by drawn-out negotiations and auctions. Their lack of transfer activity this summer might simply reflect a perceived lack of value in the market. Nevertheless, it's interesting that Liverpool and Tottenham, two clubs with good prospects of finishing in the top four this season, operate so differently. There is no evidence that Liverpool's faster start in the transfer market translates into an early edge when the league season starts, and Tottenham have gone on to finish above Liverpool in five of the last six seasons. Nevertheless, while Spurs' strategy of leaving it late to recruit appears to have worked in recent times, how sustainable is it in the long term? If they hold genuine aspirations of winning a first title since 1961, they may need to follow Liverpool's lead and become more pro-active in the market.